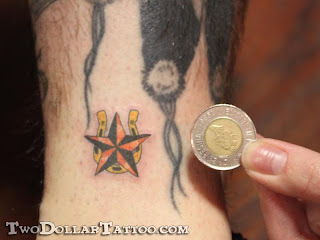 I have been chatting off and on about this project since its inseption with Gordon Bouchard, el presidente of Golden Horseshoe Tattoo (in St Catherines Ontario). 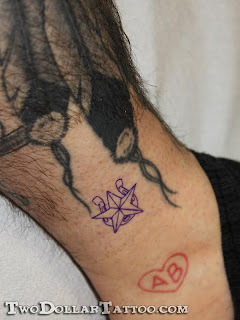 Gord is a big tattoo collector and has been rapidly running out of real estate so this project was a perfect fit for him and an excuse to also challenge his staff of tattooers. He is also a rabid self promoter as anyone who has friended him on FaceBook can attest. In all seriousness creative self promotion is how small business stays afloat in this tough economic climate. 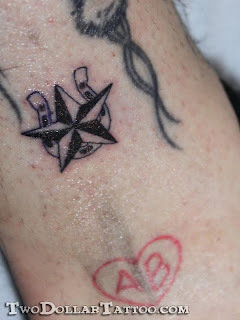 Gord went to the (smallest possible) extreme with this and convinced his tattooer Carrie Warner to ink the shop logo on him with a single needle. 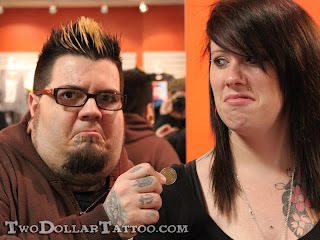 Carrie is also responsible for the mini Boba Fett tattoo you may notice if you scroll a few entries back.